A handwritten will is called a holographic will in legal terminology. A holographic will usually does not have the requisite number of witnesses. The will is valid in states that recognize holographic wills, however, if the handwriting is proven to be that of the person making the will, called the testator. All of the parts of the will that convey property must be in the handwriting of that person, and bear his signature. According to Investopedia, it must also be proven that the testator was of sound mind at the time the will was written. A will usually must have two or more witnesses to be valid. The witnesses ordinarily sign the will and then later testify or submit an affidavit in the probate court to verify the will's authenticity. 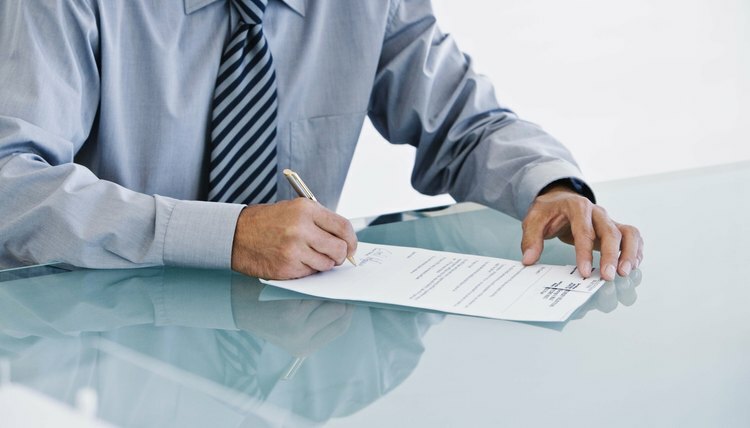 Many states have provisions for self-proving wills, in which the witnesses execute notarized affidavits in advance while the testator is still alive. In some states, a holographic will can be made self-proving by executing a similar notarized affidavit by the testator. Some of the states that recognize holographic wills only do so in special circumstances. Usually this means the testator must be in fear of imminent death and lack the means or ability to create a formal, witnessed will. Along the same lines, some states allow holographic wills written by active duty members of the military or seamen. Where such limits are in place, the amount that can be conveyed by holographic is usually also restricted. Generally speaking, probate courts in most states recognize wills that are valid in the foreign state in which they were executed. This can occur, for example, if you make a valid will in one state, but move to another state and die before revoking your previous will or making a new one. Not all states, however, recognize a holographic will even if it is deemed valid where it was executed. Florida, for example, only recognizes such a will if it meets the other state requirements of validity, including witnesses.